Preferred shares can be issued with embedded options that affect their value to shareholders. 2. How do I Convert Preferred Stocks to Common Stocks? Options, which confer important rights to buy or sell shares, are traded on common stock, but are embedded within preferred stock. Stock option trading is based on the expectation by one side of the trade that the stock’s price will rise or fall within a few months, which works well for the more volatile common stock. Preferred share prices, however, are fairly stable. Corporations issue preferred shares to raise cash. These shares pay a high dividend, comparable to bond yields. Preferred shares are not designed to benefit from the issuing corporation’s growth, and the reasons for price movement are limited. A rise in prevailing interest rates can hurt preferred share prices because stock dividend yields will seem puny. Falling interest rates makes preferred share dividends appear heroic and slowly drive up share prices. Options traders typically look for quick price action and stick to options on common stock -- most preferred shares are strictly for income, not capital gains. 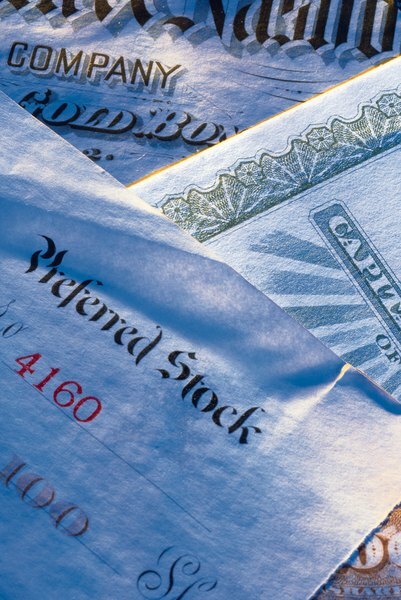 Preferred stock can be issued with an embedded call option. Corporations can invoke this option to force shareholders to sell their shares back to the company for a preset price. Corporations like embedding call options in their preferred shares because it gives them the ability to retire shares when interest rates fall. When falling rates cause preferred shares to pay a higher yield than competing debt instruments, issuers call back the shares and issue new ones with a lower dividend yield. The corporation conserves retained earnings, the source of dividend payments, through this maneuver. Preferred shareholders are stuck with low-yielding securities that have fallen in price if interest rates rise. They can sell the shares and lock in a loss. But savvy investors purchase preferred stock that was issued with an embedded put option that allows the investor to sell the stock back to the corporation at a pre-established price. Corporations don’t really like issuing shares with embedded puts, but doing so allows them to issue the shares at a higher price since buyers value the puts. Convertible preferred shares can be exchanged for a fixed number of common stock shares. This feature, like embedded puts, adds value to the preferred shares and boosts issue price. The conversion price is the common stock price at which the conversion becomes profitable. Corporations issue convertible preferred shares well below the conversion price. But if the common stock takes off, it will drag the price of the preferred shares upward. Thus, convertible preferred stock generates current income and holds out the possibility of capital appreciation if the issuing corporation prospers. The Preferred Way: Amazing Unique Way to Increase Dividends, Cash and Wealth; Bill Orr lll et al. Preferred Stocks: The Art of Profitable Income Investing; Ken Winans et al.